The capybara (Hydrochoerus hydrochaeris) is the largest living rodent in the world. It is native to South America. Its range extends throughout most of Brazil, Uruguay, Venezuela, and Colombia, south into the Argentinian pampas, and west to the Andes. Capybaras are found only in areas where water is easily accessible: flooded grasslands are a favored habitat, as are marsh edges and lowland forests where grazing is good and there is water year-round. However, they occupy a range of habitats, including dry forest, scrub, and grasslands throughout South America. The lifespan of the capybara is up to 10 years in the wild and up to 12 years in captivity. Capybaras are the largest of rodents, weighing from 35 to 66 kg (77 to 146 lb) and standing up from 50 to 62 cm (20 to 24 in) at the shoulder, with a length from 100 to 130 cm (3.2 to 4.2 ft). Females of this species are slightly larger than males. The top recorded weights are 91 kg (201 lb) for a wild female from Brazil and 73.5 kg (162 lb) for a wild male from Uruguay. Their fur is coarse and thin, and is reddish brown over most of the body, turning yellowish brown on the belly and sometimes black on the face. The body is barrel-shaped, sturdy, and tailless. The front legs are slightly shorter than the hind legs, and the feet are partially webbed. This, in addition to the location of the eyes, ears, and nostrils on top of the head, make capybaras well-suited to semi-aquatic life. Capybaras are excellent swimmers, capable of diving and remaining beneath the surface for as long as 5 minutes. They can sleep in water, keeping only their noses out of the water. They also spend time wallowing in mud. If threatened, their usual response is to flee into the water. Capybaras can run very fast with a top speed of about 35 km/h (22 mph). They can run as fast as a small horse. Capybaras are normally crepuscular, which means that they are active at twilight: early in the morning and at sunset. Because capybaras are rodents, they share some common features with mice, squirrels, and porcupines. The most well-known of those features are probably those ever-growing front teeth. Capybaras use their long, sharp teeth for mainly on grasses and aquatic plants, as well as fruit and tree bark. Seventy-five percent of a capybara’s diet is only three to six plant species. An adult capybara can eat 2.7 to 3.6 kilograms (6 to 8 pounds) of grass per day! They also eat their own poop to get beneficial bacteria to help their stomach break down the thick fiber in their meals. Capybaras are very social animals. They live in groups of around 10-20 adults of both sexes, although groups can range in size from 3 to 100; larger aggregations often form around water resources during the dry season. Each group maintains and defends a territory that encompasses feeding and wallowing sites. Among males, there is a strict dominance hierarchy enforced by chasing and, rarely, fights. Capybaras can make dog-like barks when threatened or when females are herding young. Mating season is year round with peak at beginning of wet season. Capybaras mate only in water, and if a female does not want to mate with a certain male, she either submerges or leaves the water. Dominant males are highly protective of the females, but they usually cannot prevent some of the subordinates from copulating. The larger the group, the harder it is for the male to watch all the females. Capybara gestation is 130–150 days, and produces a litter of 4 capybara young on average, but may produce between 1 and 8 in a single litter. Birth is on land and the female rejoins the group within a few hours of delivering the newborn capybaras, which join the group as soon as they are mobile. Pups are weaned at about 3 months old, during which time they suckle both from their own mother and the other females in the group, who are usually closely related. Around a year old, pups leave their parent’s groups to find new ones. Predators of the capybara include jaguars, anacondas, caimans, pumas, ocelots, and harpy eagles. 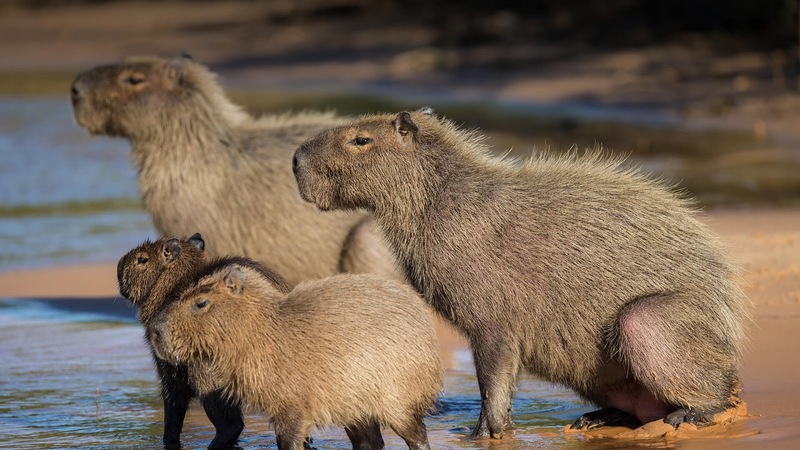 The IUCN lists capybaras as a species of least concern, citing its large population, large distribution, and frequent occurrence within protected areas. However, some local populations are in decline due to over-hunting. Capybaras are hunted for their meat and pelts in some areas, and otherwise killed by humans who see their grazing as competition for livestock. Capybaras are so trainable that in Suriname a blind man once used a capybara as a guide animal. The scientific name for capybara comes from Hydro chaeris, which means “water hog” in Greek. Capybara’s close relatives include guinea pigs and rock cavies, and it is more distantly related to the agouti, the chinchilla, and the coypu.